Last night I had my first RealTime draft of the season! This draft was for the Fantasy Championship which gives players a shot at $200,000. This is a league that me and a buddy of mine do every season. 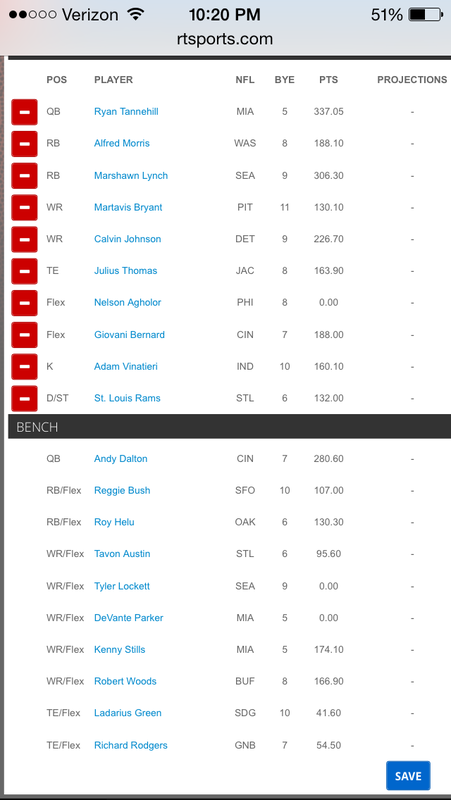 We came into this draft with high hopes as we were able to win our league last season and even though we fell a little short in the race for $200K, overall it was still a ton of fun. We were randomly given the 12th spot to draft from, and we rejoiced as we wanted no part in the 3-6 range. We ended up selecting Arian Foster and Calvin Johnson with our first two picks but because of a malfunction, we auto-selected Marshawn Lynch. After a slight panic, I regained control and took Johnson. Our next picks came at the end of Round 3 and beginning of Round 4 where we snagged Alfred Morris and Martavis Bryant. I’m a pretty big Morris guy, as he is always solid and seems to never be hyped up in the media. He is a good candidate for 1,000 yards and 10 TD’s regardless of the hype on Matt Jones. Truthfully, I didn’t love the Bryant pick as it was a bit of a reach, but it would have been a reach and pretty much all candidates available at that point in the draft. At the 5/6 turn, we selected Giovani Bernard who I truly believe is being vastly undervalued this season and had to reach on another boom or bust guy in Nelson Agholor. Our strategy was basically to take what was given to us, while filling out a balanced roster with tons of upside. Through the first 6 rounds, we drafted three running backs and three wide receivers. Picks 7 and 8 was where we landed Ryan Tannehill who I along with Jack Delaney believe can be a top 5 quarterback Then in Round 8, we scooped up Julius Thomas. I have a lot more faith in him than the general public. I don’t think he sees a big dip in targets, and he is going to be the only red-zone guy aside from Allen Robinson. Mark my words, Jaguars are going to surprise some teams this season. In Rounds 9-10 we wanted to get some more potential guys with huge upside, so we went with DeVante Parker and Reggie Bush, who will be more involved in the San Francisco 49ers’ offense than people believe. If Parker were to have a breakout rookie season, we can now stack him with Tannehill. That creates more upside for our weekly lineup. In the later rounds of the draft, it is imperative to add more depth along with prospects that you believe may hold some value during the season. In rounds 10-20, we added guys like Roy Helu, Kenny Stills, and Tavon Austin (in no particular order). We went with the St. Louis Rams D/ST who we feel has a strong chance at leading the league in sacks and has a great special teams. Kickers are meh, but we got Adam Vinatieri who is obviously going to be kicking many PAT’s this season. Prepare for the 2015 Fantasy Football season with my Ultimate Fantasy Football Playbook: Win Your League in 2015.